It is a perfect day – the sun is shining, there is a cool breeze and my grass is growing like crazy. So I pulled out the power mower and pulled the cord. It roared to life and we were off cutting that grass but I had also disturbed about 100 buzzing bees, and beetles and butterflies who were partying in my flower bed. I was engulfed in flying insects. I was not happy and yet wasn’t that part of why I have this garden – to provide food for insects, especially the bees. Here in my garden the August insects are having a great time – just what I had wanted. The bees especially are busy. They are collecting pollen from the flowers that are in full bloom. 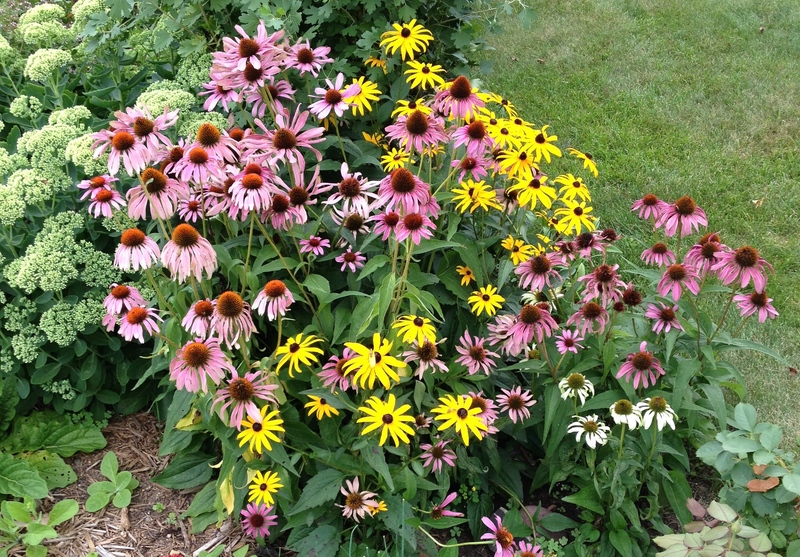 My garden has Hyssops, Echinacea, Rudbeckia, Balloon Flowers, Calendula and Celosia. 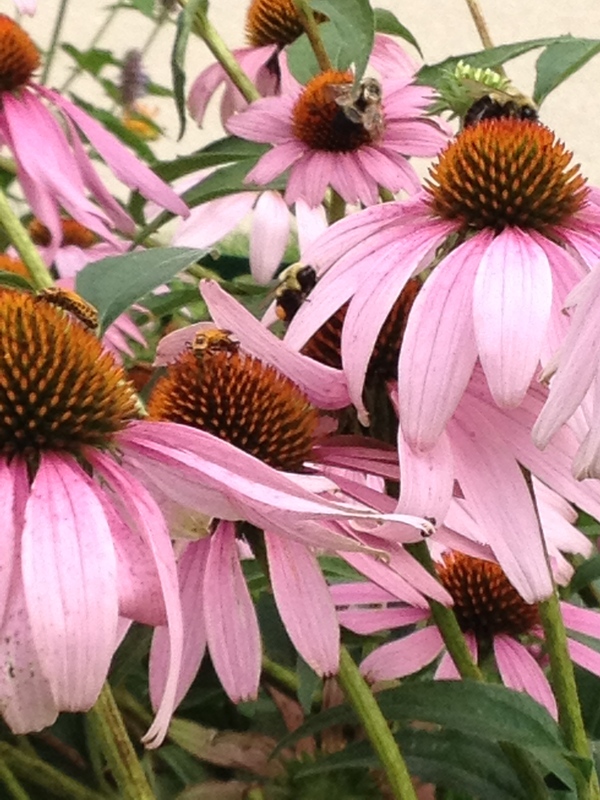 The bees love all of them but they seem to be most happy when buzzing around the Echinacea and the Hyssops. I loved the bees but I soon discovered that this great group of bees had also created a home in the ground by my vegetable garden in the back yard. There was no mowing near that underground nest. I did a bit of research and decided I had bubble bees nesting. I was sure there were bubble bees all over my flowers. I call the Bee Guy to come and clear the nest. His job was to open the ground pull out the nest with the queen bee and eggs. Her colony would then follow her into the plastic container and he would move the whole family to a better location. Great! I didn’t want to harm the bees just didn’t want to have them living in the ground where we are alway walking. I quickly discovered I was not the best entomologist (a person who studies insects). I had not identified the bee correctly. These were not Bubble Bees but Carpenter Bees. I was in a hurry and did not stop to really look at my bees closely. Scientists are great at observing. They compare and contrast – which is what my Bee Guy did and I did not. He looked closely and thought about what he know about the bees. He also did it very quickly. He knew his bees. First he compared – How are these bees the same? He then contrasted – How are these bees different? Carpenter Bees have a larger colony and can tunnel further underground- they drill through wood. It is how they got their name. 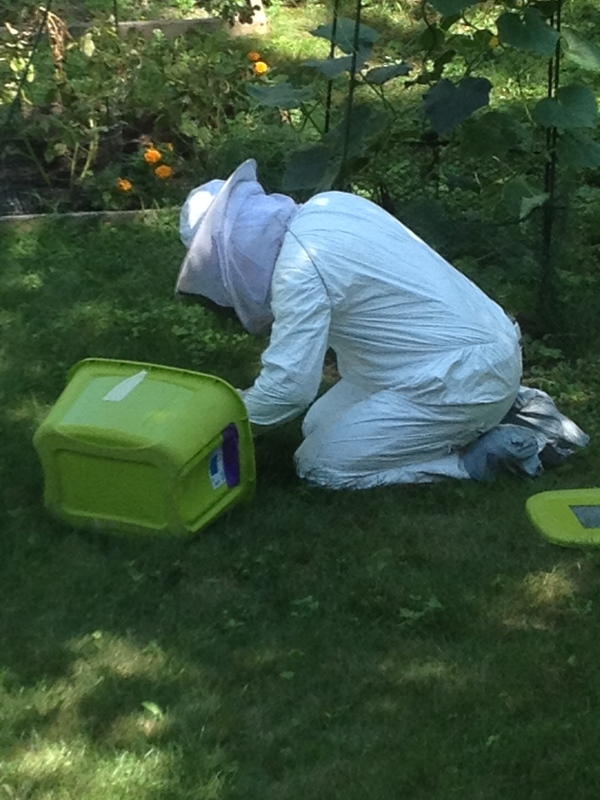 My Bee Guy then took this knowledge and was able to decide what to do with my nest of bees. We had hoped to remove them from the yard but that was not the case. This queen bee had tunneled deep into the ground where there had been old tree roots. The colony was large and well established. Since these bees drill through wood and can cause lots of damage to the house and deck we needed to clear the nest completely. This meant using a poison to kill the queen and her colony. Something I would have preferred not doing but also needed to think about the people in our yard and the house. There are so many things to learn about our natural world. It is important to use the skills of comparing and contrasting help us to slow down and look closely. We need to be able to identify our insects, birds, and flowers. If you have a nature journal this might be a great activity to do – head out and look closely at the insects in your garden. Take a few pictures to add to your notebook. Can you name them? To be sure you have the right name you might want to create a compare and contrast chart. You can draw a chart in your journal called a Box Chart. At the top of your page draw a rectangle. In this box you write all the things that are the same. Underneath that box you draw a vertical line and write the differences on either side. Unless you are really knowledgable about insects you are going to need to do a bit of research. There are lots of web sites and identification books (at your library) to help you. Once you have named your insects what more can you learn about them? What more can you write in your journal. Can you draw a picture of each of your insects? Who knew that moving the yard would lead to so much learning! 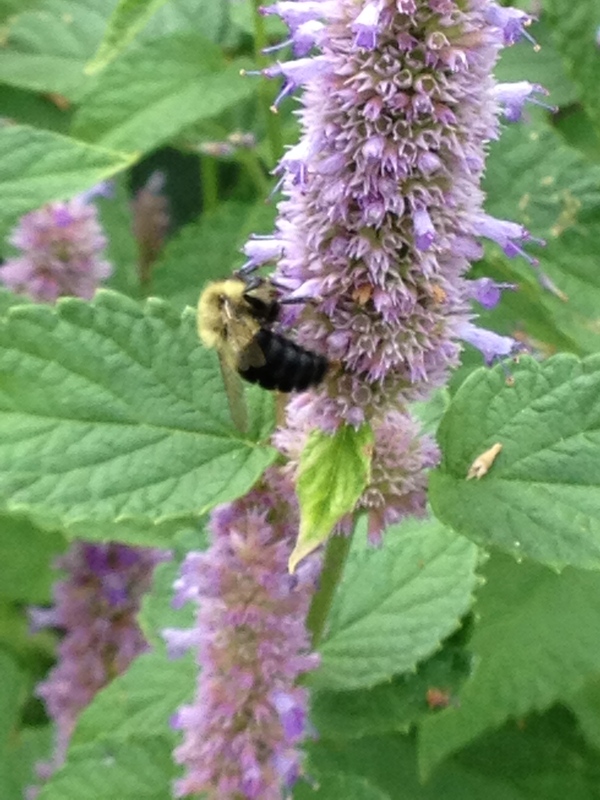 This entry was posted in Garden Learning, observation and tagged bees, compare and contrast. Bookmark the permalink.